The first types of loft conversion ideas to begin your project with will be the overall structural changes you can make. Modern living requires modern ideas. Many past clients found their new loft conversion became the best room in the house and start the renovation from there downward. People are never short of ideas for their loft conversion. I’ve worked for clients who have invested in the extra attic living space to accommodate a study, games room, kids play room, music room, hobby room, cinema or snug – the list is as long as your imagination! I have even built fitted wardrobes and shelves in a newly converted loft room that a lady had installed purely to store all her clothes, shoes and handbags in! If the house is a multiple occupancy investment property, a loft conversion could add a self contained apartment with kitchenette and en-suite bathroom that could add a significant monthly return on investment for a landlord. In terms of fitting out the loft, in order to maintain continuity throughout the property timber moldings and stair parts should match as closely as possible with the original. Or, alternatively suggest the client choose new stair parts for example and have the old balustrade renovated to match the new. Lots of loft conversions I’ve carried out have made use of glass blocks to form walls for en-suite bathrooms. Not for everyone, but another idea to consider that allows extra light into the loft conversion bathroom. Before being converted, lofts are generally used for storage. So, when you convert a loft it inevitably creates a problem in terms of storing those rarely used items such as suitcases and Xmas decorations etc. 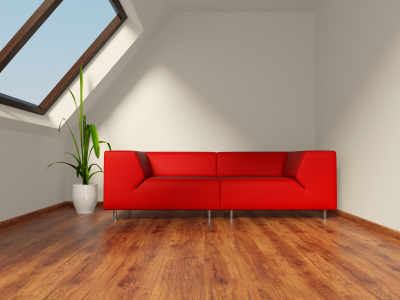 Additionally, finding wardrobes, drawers and other large furniture that will fit into a loft isn't always easy because of the angled ceilings and short Purlin walls. 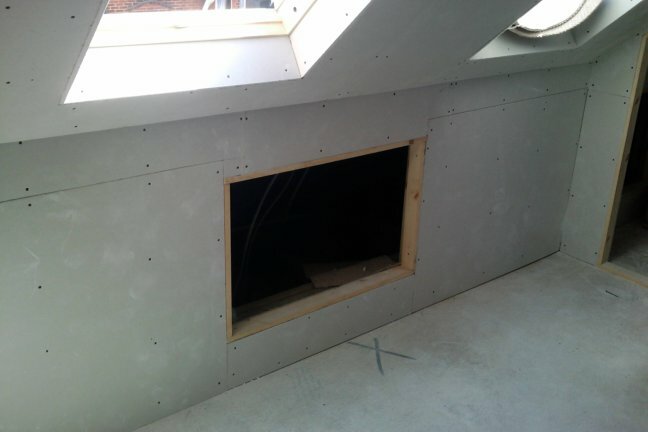 It's therefore a good idea when building a loft conversion to make use of the eaves space that's left behind the purlin walls and install a door, or pair of doors that can access that area. 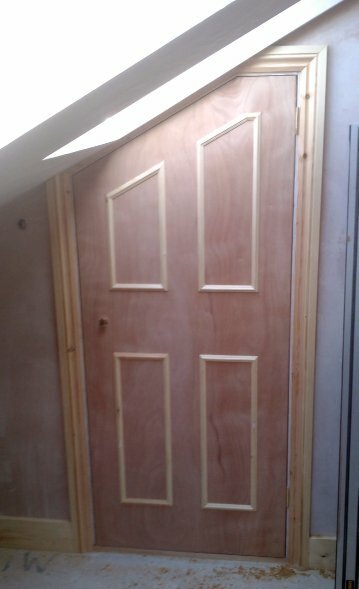 Above is a lining I installed for a pair of 18" ply flush doors because they can be cut to any height. Although ply flush doors are very plain, there are a few things that can be done to make them look nicer. If the house is old and has paneled doors beading the access doors will help them tie in more with the general theme. Alternatively strips of MDF can be glued and pinned on the doors to create a shaker style door when hung. I always recommend clients pay a bit extra for built in wardrobes. They're really easy to install during the first fix construction phase and simply involve some stud-work, insulation and plasterboard, then doors, architraves and shelving after they're plastered. Fitting out an en-suite in a loft can be awkward. But, as long as consideration is given to where the waste pipes can be routed then everything else can usually be overcome. Worst case scenario is that you need a Sani-flow. This is a maserator and pump, that can overcome the need to have a fall on a sink/shower/bath waste pipe by pumping the waste out rather than relying on gravity. If you want a shower and don't have a large flat roof dormer, it will probably be best at the highest part of the conversion, generally under the ridge. You'll have more of a chance of getting the shower door to fit there. Use the comments section below to add your own loft conversion ideas?